It's audacious for a fifteen year old boy to hire the world's largest indoor stadium, announce the formation of an organization that will feed and house all humanity, declare that he will establish peace on a global basis, and reveal to everyone who asks, a deeply satisfying experience of the infinite source of peace within them. Yet the contract has been signed, and in the Houston Astrodome this November, fifteen year old Guru Maharaj Ji will do just that. 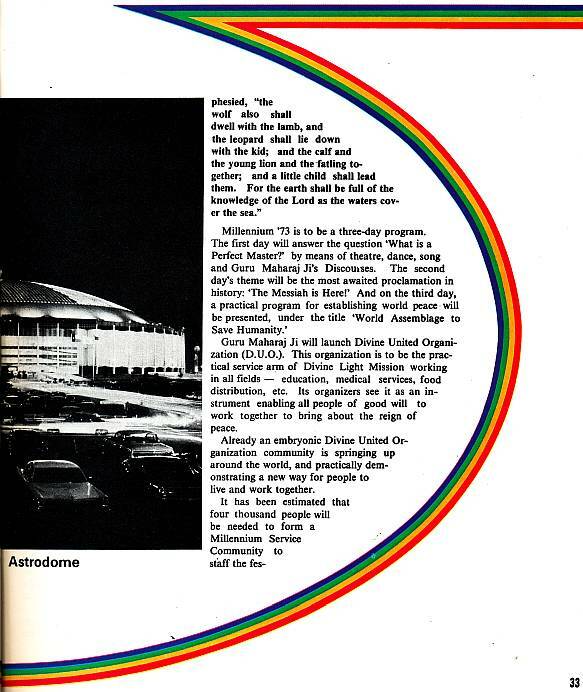 The Houston Astrodome is sometimes called the Eighth Wonder of the World. It is the largest dome in the world, 642 feet clear span, 4½ times larger than the Roman Pantheon. Indeed, it is so large that if its air conditioning were switched off for a week and then switched back on, the cold air would condense enough moisture to cause rainfall within the building. This November 8, 9, 10 the Astrodome will witness Millennium '73, a festival of love in action which shall serve as a blueprint for the golden age. Plenty of people now realize that we cannot continue to act as we have in the past. We have polluted our planet to the point where it has become difficult to find a breath of fresh air to breathe, we have exploited the natural resources of our planet to the point where our exploitation backfires on us, and we are experiencing an energy crisis and a food crisis. Our wars have recently become so destructive that the whole planet is permanently under threat of total annihilation. We have tampered with the weather. We see drought in India, Africa and South America, flooding in the United States. Both suggest that the natural balance has been seriously disturbed. More than one in three persons on this planet is likely to suffer from famine this year. And so forth. Some months ago, Rennie Davis told And It Is Divine, "Guru Maharaj Ji is now putting together the only truly effective social movement capable of ending war, poverty and hunger. He has already assembled the most incredible human talent I know of in any organization." Now Rennie, himself a legendary organizer,is lending his talents to the general coordination of Millennium '73. Says he, "Without a doubt, this festival will usher in the age of peace. And that's something I want to be a part of." Millennium '73 is itself the first western celebration of Hans Jayanti, a festival which has been held in India every year for decades, drawing crowds of a million or more people. Hans Jayanti celebrates the birthday of Satgurudev Shri Hans Ji Maharaj, the father and Teacher of the present Guru Maharaj Ji. "Throughout his life, he wished only to spread this Knowledge freely to all who asked. We have plenty of fuel to set fire to this world, but who among us has an extinguisher to put the fire out? What extinguisher is there, apart from this Knowledge? So take this Knowledge, and put out the file of this world. That was his philosophy, and that was his life." "Give me your love, I will give you peace. Come to me, I will relieve you of your suffering. I am the source of peace in this world. All I ask of you is your love. All I ask is your trust. And what I can give you is such peace as will never die. I declare I will establish peace in this world. But what can I do unless men come to me with love in their heart and a keen wish to know peace and Truth? "I will give you such a state where there is no a single pistol, nor a single leader to give slogans. Nor will there be an army. "I have a Knowledge that will tie you up in the thread of love. I tell you, the time is coming soon when everybody will be friends." Joan Apter was one of the few westerners who attended the 1970 festival. She recalls, "It was the most historic program. The second night, Guru Maharaj Ji spoke so powerfully that every single person in the audience was weeping. And then everybody just held their breath, because we saw that Guru Maharaj Ji was also weeping. He took a handkerchief from his mother, Mata Ji, and began to daub his eyes very brusquely, as if it were almost an inconvenience, such absolute power was coming through him. "Then Guru Maharaj Ji left the stage, and his brother Bhole Ji sang a song about Guru Maharaj Ji's love, and everybody began weeping again. I'll never forget that song of Bhole Ji's. "Every phase of that entire Hans Jayanti festival was directed by Guru Maharaj Ji's eldest brother, Shri Bal Bhagwan Ji. made all the devotees work so beautifully twenty-four hours a day, preparing for the festival. Everyone was completely in bliss, and amazed at what they were able to do. A spiritual exhibition was erected in one field, and a huge three-tiered stage in another great field, where Guru Maharaj Ji was to speak. Over a million people attended, and Bal Bhagwan Ji organized a procession that was fourteen miles long, and took ten hours to pass. It was absolutely the most splendid festival." In 1971, Guru Maharaj Ji's western disciples chartered a 747 jumbo jet to fly them from London to Delhi to attend Hans Jayanti. 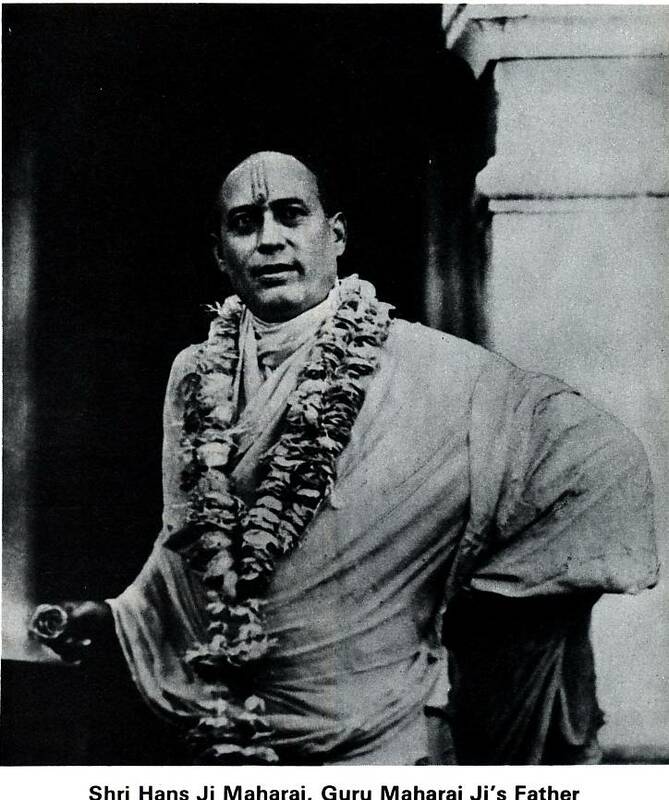 This time Bal Bhagwan Ji arranged celebrations both at the Ram Lila grounds in Delhi, and at the Nehru grounds in Patna, several hundred miles away. The 1972 festival was truly international. Disciples from Italy, Germany, England, Japan, Denmark, U.S., Canada, New Zealand, France, Holland, Switzerland, South Africa and Scotland chartered no less than seven jumbo jets to attend the massive gathering at Delhi's Ram Lila grounds. The Millennium. The arrival of a thousand years of peace and prosperity. Utopia in action. The Kingdom of Heaven established on earth. A truly human society. A global civilization based on the values of love and compassion. Christ predicted that gentle people would inherit the earth. Isaiah prophesied, "the wolf also shall dwell with the lamb, and the leopard shall lie down with the kid; and the calf and the young lion and the fatling together; and a little child shall lead them. For the earth shall be full of the knowledge of the Lord as the waters cover the sea." Guru Maharaj Ji will launch Divine United Organization (D.U.O.). This organization is to be the practical service arm of Divine Light Mission working in all fields – education, medical services, food distribution, etc. Its organizers see it as an instrument enabling all people of good will to work together to bring about the reign of peace. Already an embryonic Divine United Organization community is springing up around the world, and practically demonstrating a new way for people to live and work together. ival. In order to recruit this huge crew without disrupting the local programs of the growing DUO communities, the entire staff will be organized locally. The Millennium Service Community will arrange housing, transportation, food, medical services, child care, and parking for the eighty to one hundred thousand people expected to attend. "When the Jehovah's Witnesses were at the Astrodome for their five day meeting in July, they were feeding twenty thousand people at a time. I'd never seen an operation like that just built from nothing. They all worked together to build the kitchen. They really used their imagination and ingenuity, and their systems were very clear, very together. They opened up to us and gave us more and more information, they summarized years and years of experience feeding large gatherings. And now we're able to use that information for ourselves. "Millennium '73 is really a trial run for us. If our own community isn't together, then there is no way we're going to feed the rest of the world. So we're trying to tighten up our system now." "Guru Maharaj Ji has said we need to understand the root of all disease, which is really the conflict between mind and soul. We have to come into the world to uplift people in every way." Parents are being encouraged to bring their children to Millennium '73, for the child care provided will be more than a babysitting service. The round of activities will include music and drama, arts and crafts, play and recreation. Shri Hans Educational, another DUO agency, is planning a complete program for the children, so that they too can celebrate Millennium. City, and Houston's consciousness is much wider than most. Houston people are very special," said one DUO official. "They're Texans, they're big," said another, "and they think big. So when we come up with a big thing like 'The Lord is Here,' they're open enough to consider it." "I was sitting meditating one night just a few weeks after receiving Knowledge, and a voice said very clearly in my head, you're going to write an Oratorio, about the Word of God, and it's going to have these instruments in it and these choral parts. It was very specific. "I woke up the next morning and my mind said, this isn't practical. I've never written a work this big. I've only done string quartets. I really can't do a thing like that. And the whole time my mind was telling me this, I was getting together manuscript paper and finding a piano. I sat down at the piano and started to meditate, and it just started to come out, it was so easy. Composing had always been a laborious process for me, but this music just flowed straight out of me. And after I had noted it all down, 1 realized just how cohesive it was. I knew it just wasn't me that was doing it at all. "As it happened, I came with Ricardo and the Dance Ensemble to Houston the next day." 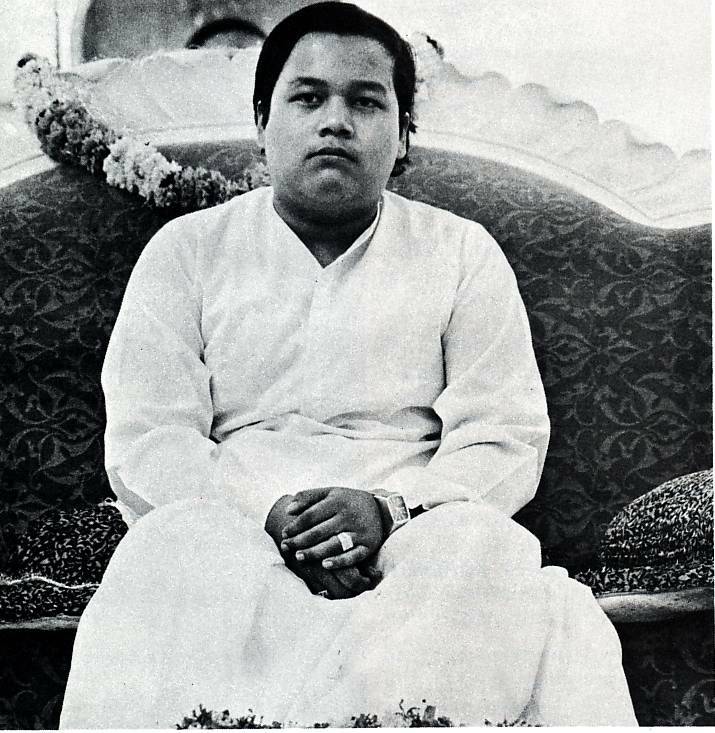 Rennie told us, "In meditation the morning before Erika arrived, a choir began to sing in my head, 'A child was born, a child was born …' It was on the order of Handel's Messiah, but it was about Maharaj Ji. It was fantastic! So I was thinking it would be great to present the history of Maharaj Ji's family as an Oratorio, and was wondering who could write it, when Erika arrived." Erika: "When we were introduced that night and it all came out, we just sat and laughed at each other for about ten minutes because we'd had the same thought within a day of each other." Other major works which will be performed at the festival include a play about Jesus, and the Krishna Lila dance. 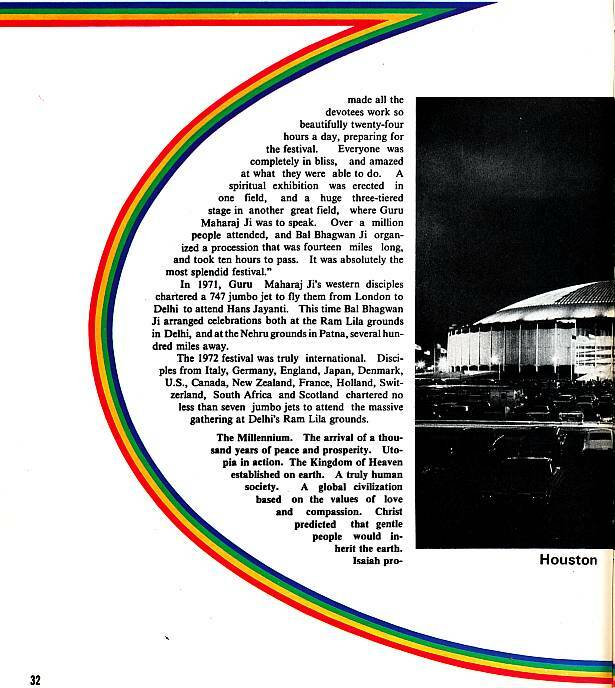 The unique problems of presenting a play in a stadium the size of the Astrodome demand original solutions from the four playwrights working in collaboration on the project. They are creating "Astrotheatre." As one of them put it, "From way up at the top watching the performers, it's like seeing insects moving around. When the actors are making big motions, they have a certain nobility. But watching them is rather like looking through a microscope." Bhole Ji, one of Guru Maharaj Ji's brothers, has assembled Blue Aquarius, a forty piece band that will provide the festival's musical heart. Rennie Davis sums it all up. "Our purpose is to provide a platform for Guru Maharaj Ji to speak to America and the world. Guru Maharaj Ji's discourse is the focus of the whole event. If Jesus really were back and about to deliver the Sermon on the Mount, everybody would want to come, wouldn't they? Now Guru Maharaj Ji is here, and this is our chance to sit at his feet and hear him speak."